I'm particularly careful in parking a car. Being a bit obsessive-compulsive, I really make it a point to be within the yellow lines in a parking lot. I'm accustomed to parking facing the wall too. And if I'm beside two other cars, I see to it that the tail end of my car isn't as exposed to the street. 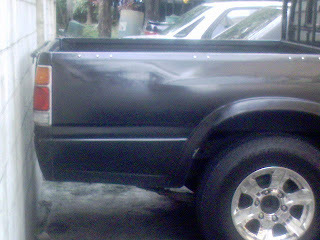 So if some car happens to get out of control, my car is shielded by the two cars beside me whose posteriors are longer. 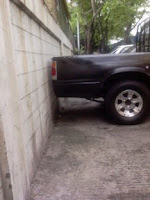 Early today, I parked at the nearby mall and when I got off, I was surprised to see the Pickup parked beside me literally an inch away from the wall. I wouldn't let my car go that near to a wall. (Did I mention that the other side of the wall happens to be a 3 story boarding house ? ) There is no room for mistake here if the driver happens to put the gear in reverse. I can understand the Pickup is a much longer vehicle than other standard sized cars. I think parking lots should consider having a section for medium to large sized vehicles especially with the proliferation of SUVs. Their sheer size and built occupy more than the allocated space of standard parking spaces and sometimes even takes extra space off of other car's parking space. I'm just happy I haven't experienced parking beside a monster truck yet. Wow! New blog look ha! As you know, I really don't like driving. I can only drive up to about 5 kilometers from home and I'm quite scared about parking the car and I absolutely go bonkers whenever I need to back-up. I wouldn't want to park beside a monster truck either. Katakot yun!